(b) Law of independent assortment. Mendel presented his findings to Brunn Society for the study of Natural Science in 1865. His work was published in 1866. Thus he started classical genetics. His work remained neglected for 34 years. In 1900 three botanists; Correns, De Varies and Tschernimach rediscovered his work independently after 16 years of his death. It is easy to cultivate and it grow well in his garden. It was normally self-fertilizing. But it can also be cross-fertilized. The time gap between generations of pea is short. 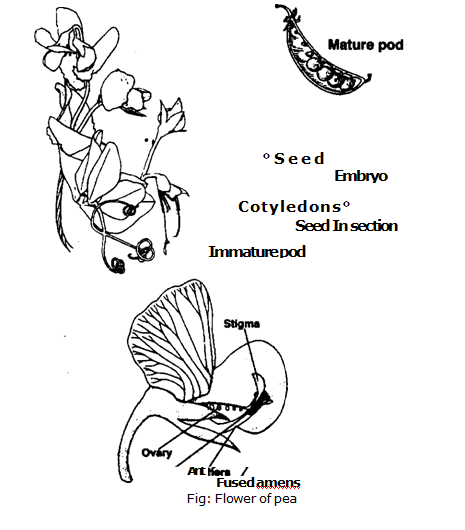 So Mendel can produce many generations of pea within a short period of time.Pea has many sharply distinct traits. Each trait had two clear cut alternative forms or varieties. For example seed shape has a round or wrinkled phenotype. Similarly plant height may be tall., or short. Seed colour may be yellow or green. Mendel called them contrasting pair of a trait. He focused on seven such pairs. A variety which always produces offspring identical to the parents by self- fertilization is called true breeding variety. For example, a true breeding round seed plant produced only round seeds. Similarly, a true breeding wrinkled seed plant produced only wrinkled seeds. Mendel established true – breeding lines or varieties for each trait. Mendel used two types of crosses to prove his law of segregation and law of independent assortment. 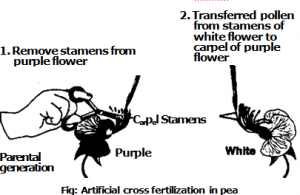 (a) Monohybrids and monohybrid cross: The offspring produced by the cross fertilization between two plants differing in one character are called monohybrids. The cross in which one trait is followed at a time is called monohybrid cross. Mendel formed 14 pure-breeding lines of seven characters. Then he cross-fertilized plants that differed in only one character. lhe offspring of such a cross were called monohybrids. 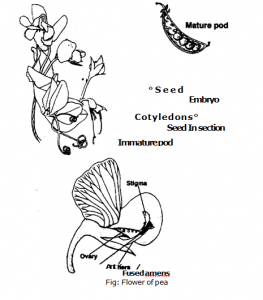 Fie crossed a true breeding round seed male plant with a true weeding wrinkled seed female plant. Mendel used mono`iybrid cross to prove his law of segregation. two traits is followed at a time is called dihybrid cross. Mendel used dihybrid cross to prove his law of independent assortment. (a) Parental generation (PI): When two pure line parents are crossed with each other, they are called first parental generation (P1). The round seed plant and Wrinkle seed plant are PI generations. generation are called F1 or first filial generation. All F1 offspring were round like one of the parents. Wrinkled phenotype did not appear at all. Round dominated wrinkled. Its dominance was complete because no offspring intermediate between parents was found. (c) Dominant and recessive trait: The trait that appears in F1 is called dominant trait or allele. The trait which is masked in F1 is called recessive trait or allele.